Aloe vera, with its spiny, succulent leaves, is much more than just a pretty houseplant. 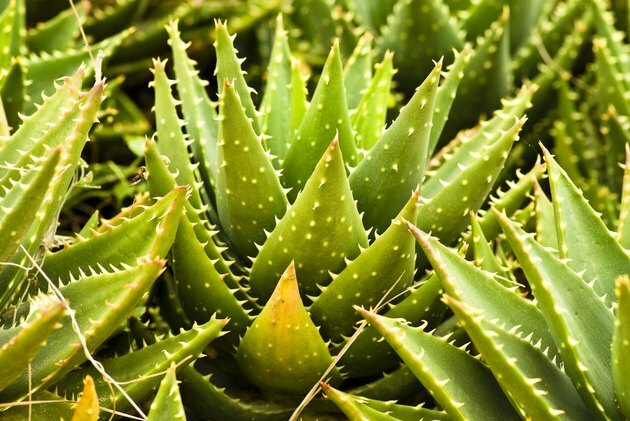 Aloe's leaves are packed with a clear gel that soothes sunburn, bug bites and other skin irritations. Many drugstores sell aloe-vera lotion, but some brands include alcohol and artificial fragrance -- two things that can make skin problems even worse. If you'd rather say no to unnecessary additives, try whipping up your own aloe lotion. Once you've sampled your homemade lotion, you may never want to buy the store-bought stuff again. Set a small pot on a stove burner, then set a large heat-proof bowl on top of it. Add 1/8 cup of grated beeswax, 1/3 cup of coconut oil and 1/4 cup of avocado or sweet almond oil to the bowl. Mix in 1 cup of cocoa butter or unrefined shea butter. Set the stove burner to medium heat. Stir the ingredients occasionally until they're fully melted together. Add several drops of lavender essential oil for fragrance. Mix in 1 tablespoon of aloe-vera gel and 1 tablespoon of honey. Continue heating and stirring the mixture until all of the ingredients are fully dissolved. Remove the bowl from heat and let it cool to room temperature, then set the bowl in the refrigerator until the mixture hardens. This normally takes about three hours. Scoop the mixture into a blender, then blend for five minutes. When done, the mixture should look like runny whipped cream. Pour the mixture into a mason jar with a lid. Wait three to four hours for the lotion to solidify. Smooth a dollop of the lotion over your skin when you're ready to use it. Do not rinse off. Store any unused lotion in the refrigerator for up to two months. Grate two large carrots and one cucumber into a large saucepan. Add 1/2 cup of sesame oil. Set the pan on the stove and adjust the heat to the lowest setting. Heat the ingredients for 20 to 30 minutes, stirring occasionally. Set another large pan in the sink, then hold a strainer over the pan. Pour the vegetables and oil into the strainer. Discard the vegetables. Put the pan with oil in it back on the stove. Add 1 teaspoon beeswax and 1 teaspoon emulsifying wax. Stir until the ingredients have melted fully. Add 1/2 cup of aloe-vera gel and 1 teaspoon of vitamin C powder. Whisk the ingredients into the oil until the mixture is smooth and creamy. Pour the lotion into a mason jar, then allow it to cool at room temperature. As it cools, the lotion will thicken. Apply the lotion liberally to irritated or sunburned skin. Store unused lotion in the refrigerator for up to two months. You can also make organic versions of these lotions. Look for organic oils, honey and other ingredients in a health-food store. If you don't like lavender fragrance, you can omit it or use a different essential oil. Try scents such as rose, orange, peppermint or sage.